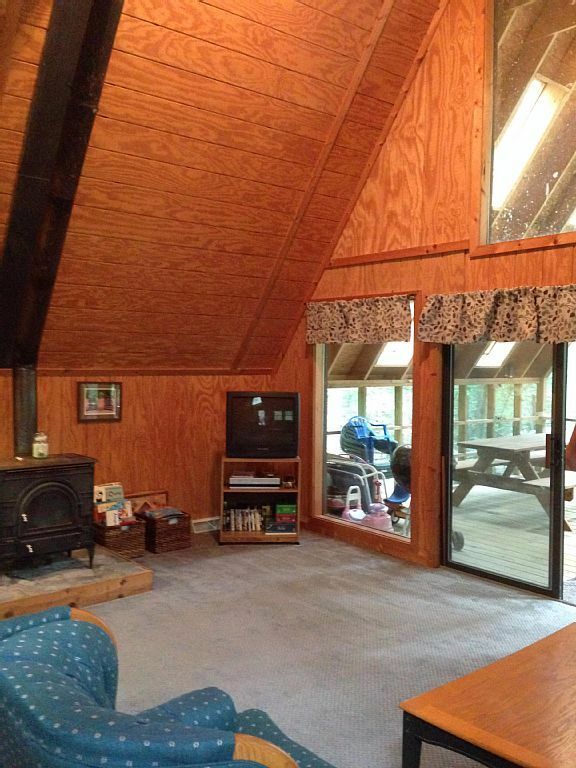 Those who love interesting and unique floor plans are often fans of A-frame cabins. The exteriors of these homes are fantastically original, whilst the individual architectural style creates an internal living space which is like no other. Yes, A-frame cabins are fun and represent a quirky alternative to more traditional rural wooden retreats. One of the main issues with A-Frame cabins is a lack of space upstairs - where sleeping lofts can often be a little cramped. 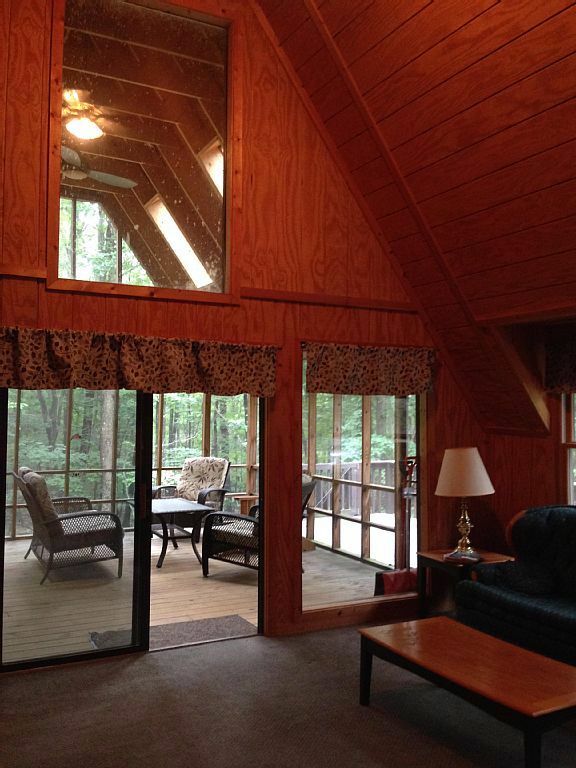 Coolfront Mountainside is a rustic A-frame cabin listed as a vacation rental on VRBO. This rustic retreat benefits from the unique living space which A-frame cabins offer, whilst including three bedrooms with ample space to sleep eight people. 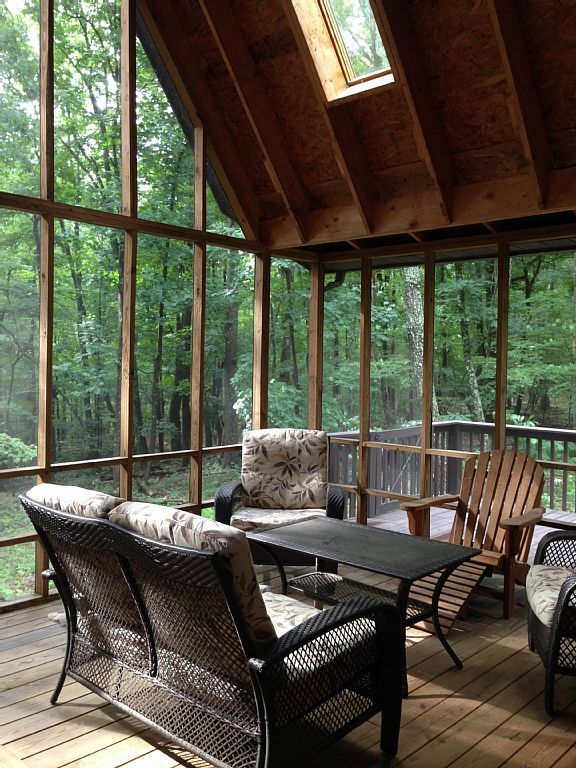 Coolfront Mountainside features an expansive porch which is covered and screened for comfort. The porch features plenty of furniture to complement your outdoors lifestyle. 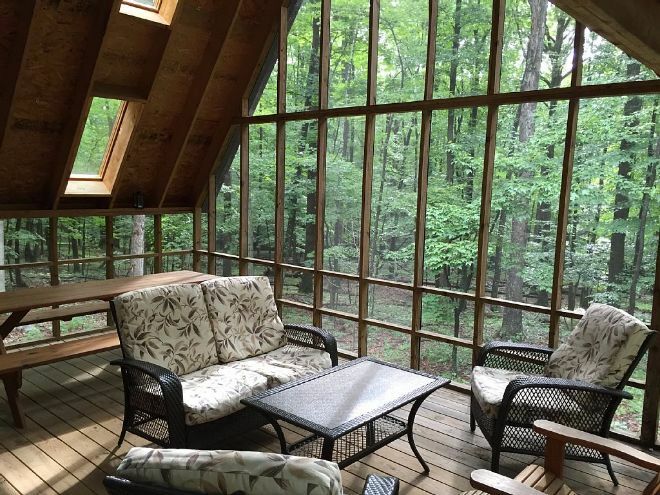 The A-frame of this cabin creates an airy space filled with the smells of the forest, whilst plenty of windows and skylights ensures the home has fantastic natural light. Sliding glass doors lead from the living room to the large porch, creating a seamless flow from inside to outside. 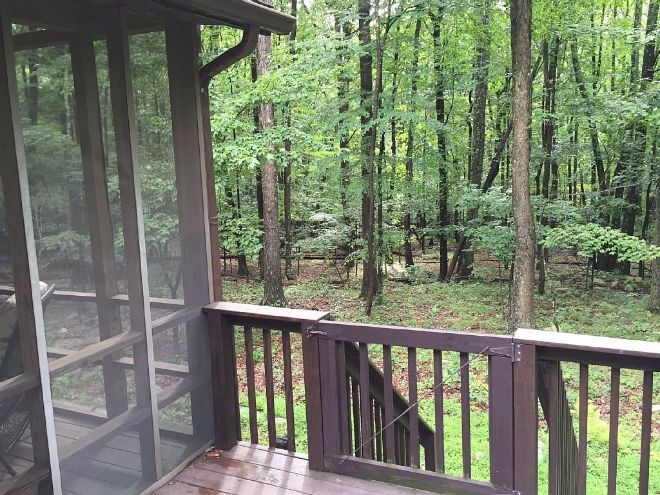 This relaxing cabin is located in Berkeley Springs, WV. 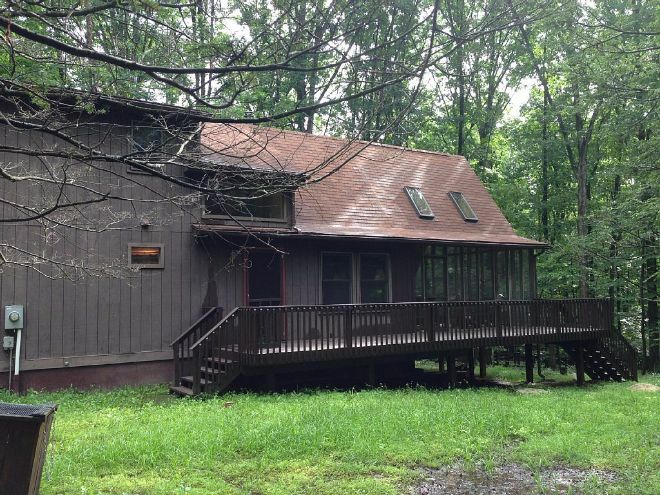 It is adjacent to the expansive Cacapon State Park, offering a wealth of woodlands to explore directly from the front door of this rustic retreat. 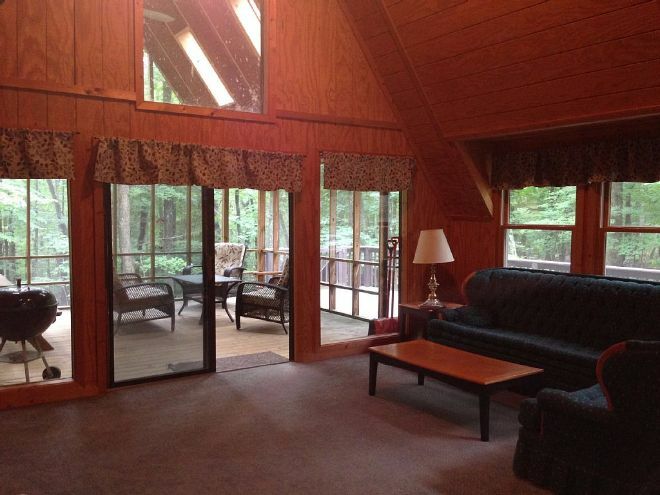 Inside the cabin, we find a cozy living room which can easily be heated by a beautifully antiquated wood-burning stove. 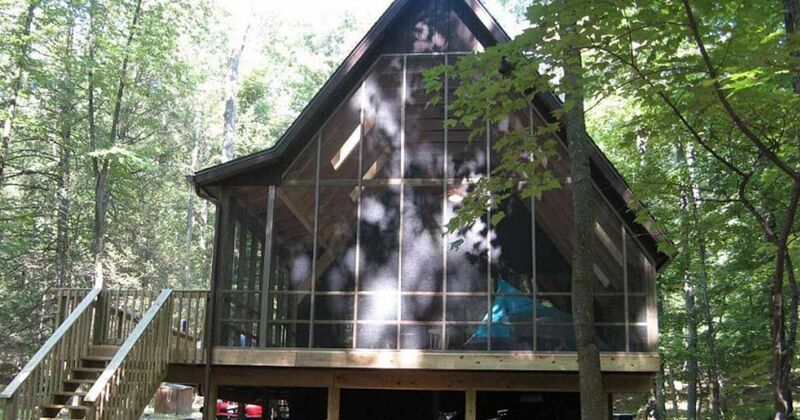 Taking a look from outside of the cabin, we can see how the A-frame is attached to a more traditionally-shaped building - giving the best of both worlds. 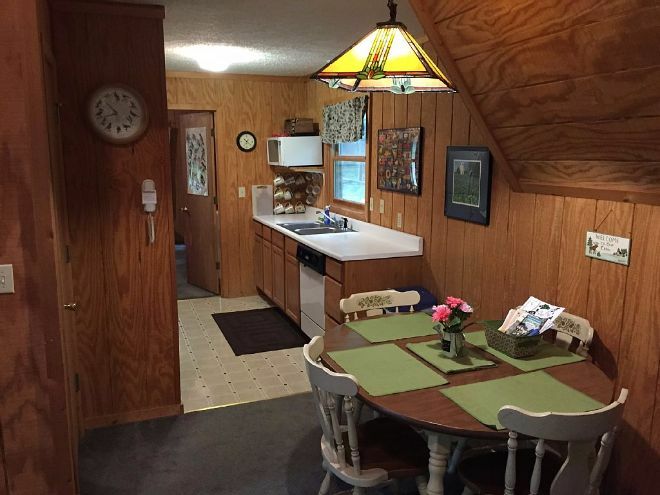 The kitchen is open to the designated dining area, offering ample space for preparing and enjoying a meal. 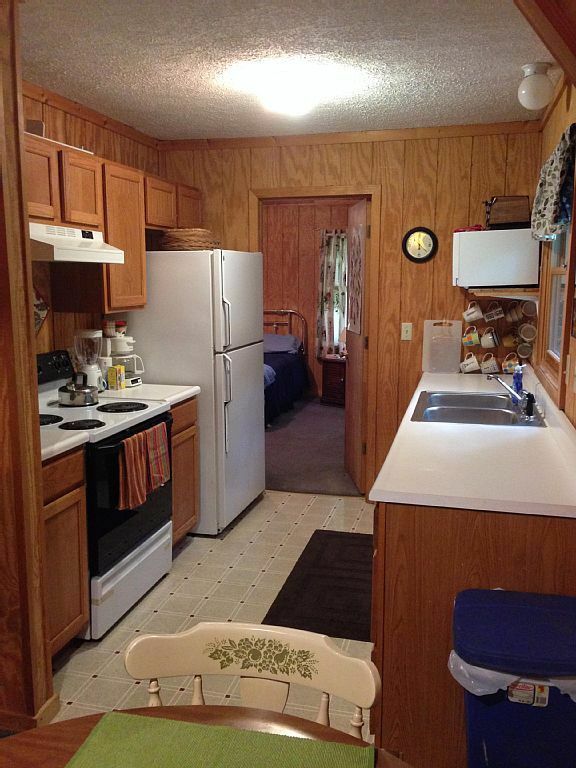 The kitchen has an attractive design and includes a full range of modern appliances. 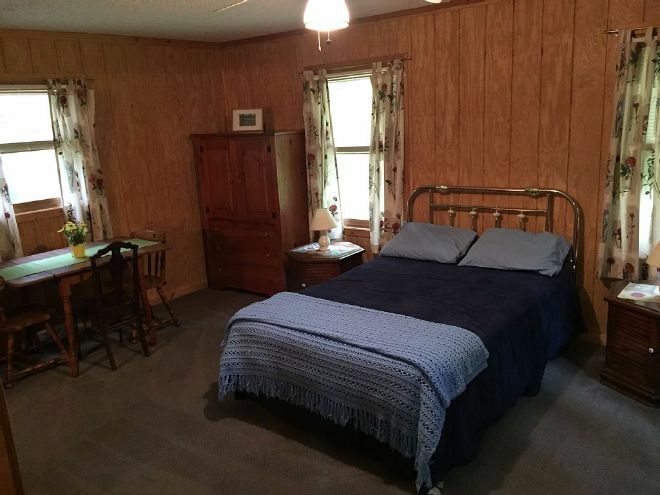 The master bedroom in Coolfront Mountainside is a spacious and inviting place to retire at the end of an evening. The room benefits from the more traditionally shaped section of the house, with a higher ceiling than most A-frame cabins. 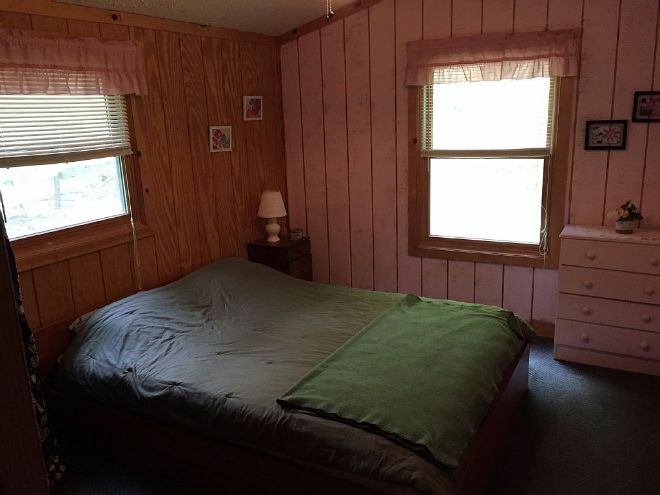 The second bedroom is also generously spaced, with the feel of a full room rather than just sleeping quarters. 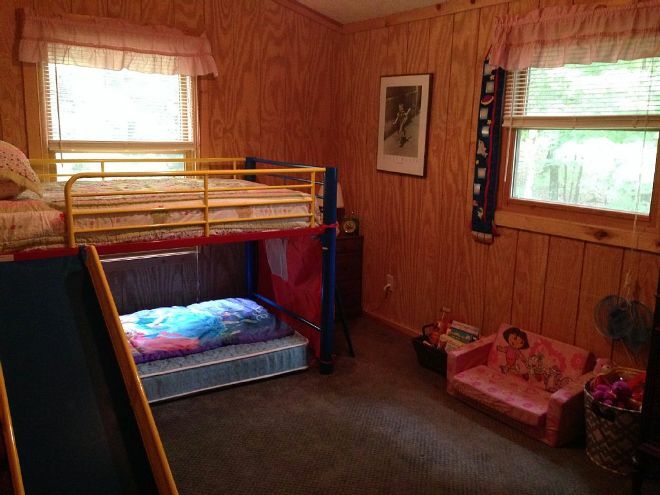 The third bedroom includes bunk beds for children and ample floor place for games. Coolfront Mountainside has two full bathrooms which have well-appointed fixtures and fittings. 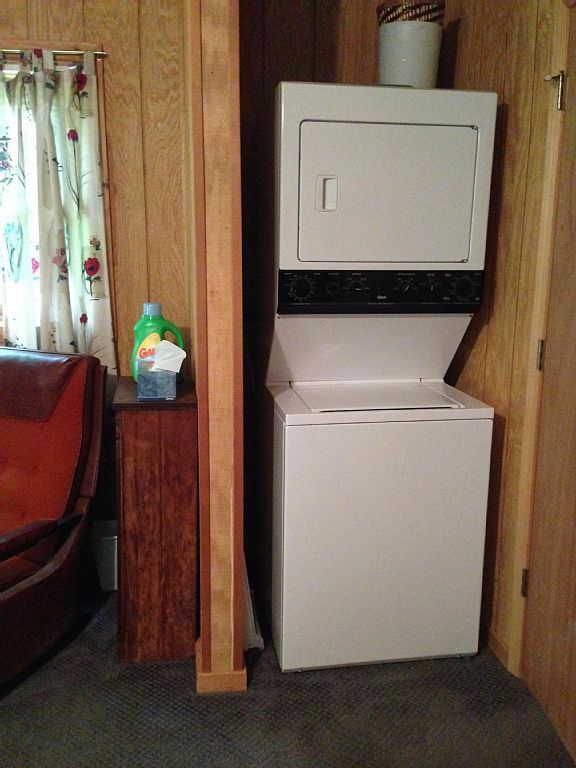 The cabin is completed with a stand-up washer/dryer. 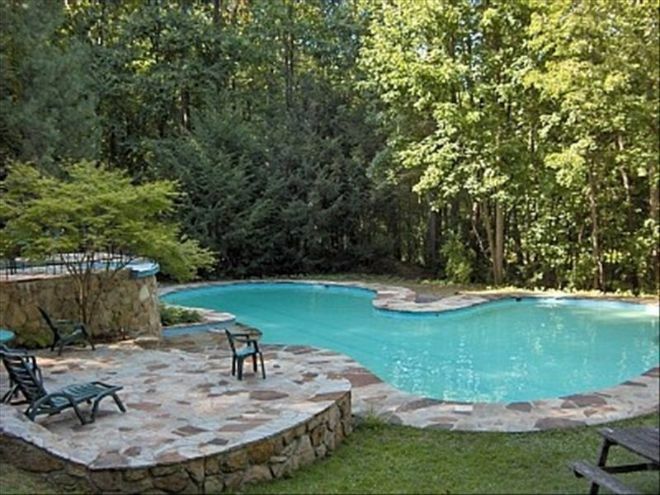 As we step back outside into the fresh air of the forest, we find the final gem of this vacation rental: a refreshing communal swimming pool. 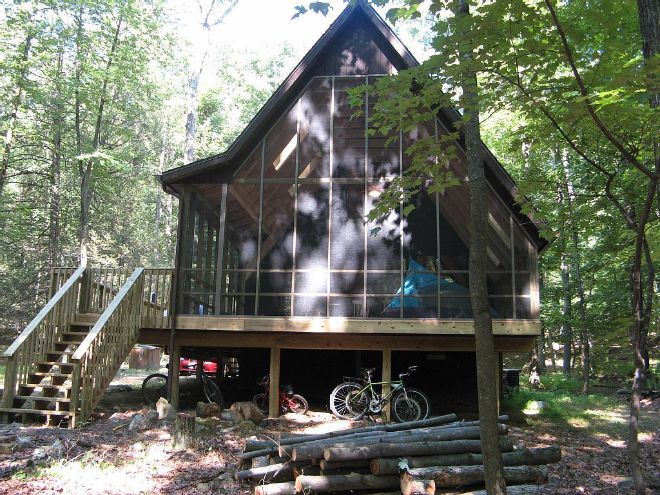 This A-frame cabin offers an attractive floor plan yet the practicality of housing a full party. What do you think? 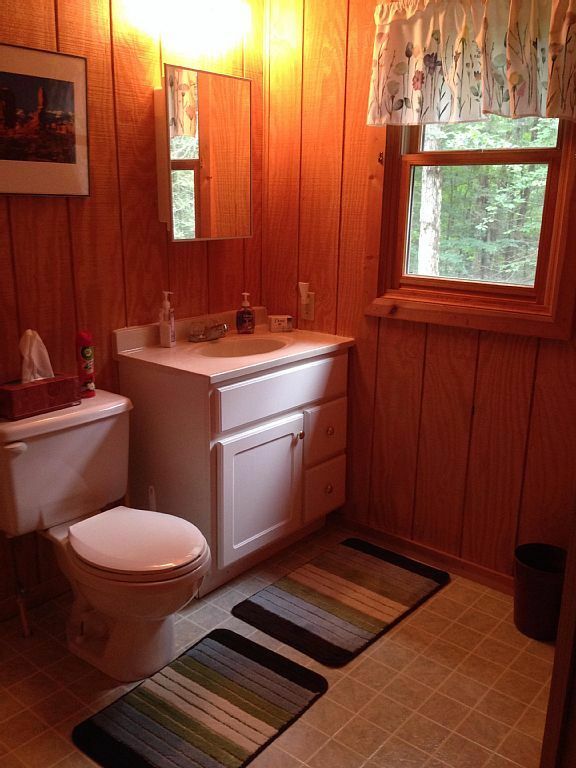 LIKE and SHARE on Facebook to show your appreciation of log cabins!